The holidays are coming! 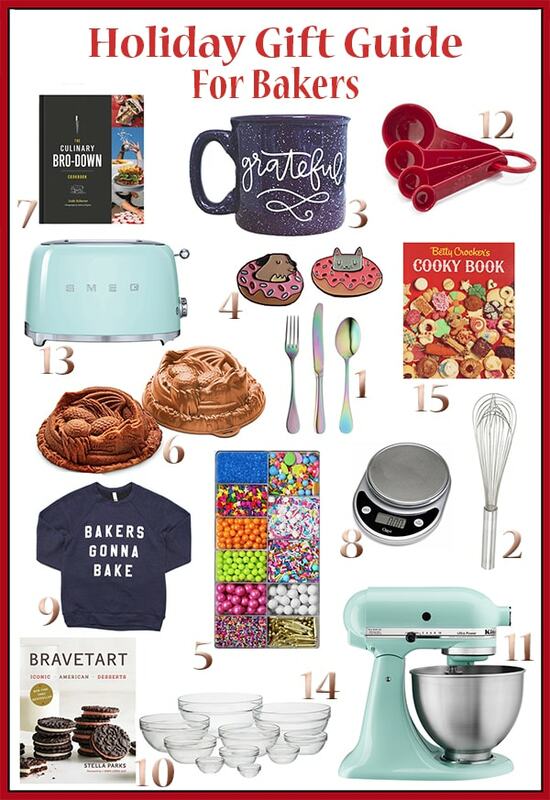 If you have a baker in your life you’d like to shop for, or you are a baker and wondering what to put on your wishlist, this holiday gift guide is a collection of must-have items bakers will love. It’s a combination of my favorite baking tools, plus a few things that I would love to have in my own kitchen. If you have a question about any of the items I’ve recommended, please comment below! 1. Pretty flatware: There’s nothing food bloggers love more than pretty props, so these are on my personal wishlist. One set is probably enough, unless you really like unicorns. 2. Mini Whisk: I don’t know why, but I’ve always found whisking awkward. Maybe it’s because I’m 5’2”, but this little mini whisk makes it so much easier. 3. Grateful mug: Did I mention I collect mugs? No? Ok, I collect mugs. Great for filling with hot cocoa, coffee, or whisky. 4. Donut Cat or Dog Pin: Whether you’re a cat or dog person, we can all agree on one thing: Donuts are awesome. Get my recipe for red velvet donuts here. Then grab this cat enamel lapel pin… or the dog one. 5. Sprinkles: Recently, I mentioned that I have an entire drawer of sprinkles. It’s true! I love sprinkles and the sprinkles from Fancy Sprinkles are so much fun! This electric birthday sprinkle bento box is versatile enough to be used all year long. 6. Dragon Baking Pans: Winter is coming. So is the last season of Game of Thrones. You want to be ready. Serve a slice paired with this Game of Thrones Ice Cream. 7. The Culinary Bro-Down Cookbook: I didn’t intend to buy this book. Then I spent about 30 minutes reading it in the store and laughing so hard I thought someone might call security. Also, there’s a recipe for s’mores burritos inside. So. 8. Ozeri Kitchen Scale: If you bake often, you’re going to need a kitchen scale. I’m obsessed with this one. It’s reliable, lightweight, and inexpensive. What’s not to love? 10. BraveTart: Iconic American Desserts: Want to perfect homemade Oreos or Pop-Tarts? Or any classic dessert? Expert baker and culinary genius Stella Parks has you covered. Great for baking novices and experienced bakers alike. 11. KitchenAid: If you put one thing on your wishlist this holiday season, this should be it. Hand mixers are great if you need to mix something on the stove or if you’re shooting a food video, but for everyday baking, the KitchenAid stand mixer is an investment that’s really worth it. I have the 4.5-quart KitchenAid classic stand mixer and I’ve been using it since 1987. Feel free to ask me questions about it in the comments! 12. Measuring Spoons: These are not fancy and that’s on purpose. I feel a lot less guilty when one of these inevitably gets chewed up in the garbage disposal. 13. Smeg Toaster: This toaster really needs to win a prize for The Cutest Toaster Ever. Because it is. 14. Nesting bowls: This is the set I use. There are enough bowls and enough different sizes that I usually don’t have to wash any before I finish baking – even if I’m making a few recipes. 15. Betty Crocker Cooky Book: The name of this book is nails on a chalkboard to my brain, but the recipes make up for it. It’s what I turn to for some of the original cookie recipes we now consider classics. Some of the links in this post are affiliate links and I will earn a small commission if you purchase through those links. I only recommend products I love and think you will too!